More than 10,000 Protestors marched on Westwood, Los Angeles in a big show of solidarity and support for Palestine and the besieged people of Gaza. At the van of the march were Palestinian flag draped coffins symbolizes the death and destruction in Gaza wrought by Us-Israel war machine terrorists. Los Angeles — More than 10,000 Protestors marched on Westwood, Los Angeles in a big show of solidarity and support for Palestine and the besieged people of Gaza. At the van of the march were Palestinian flag draped coffins symbolizes the death and destruction in Gaza wrought by Us-Israel war machine terrorists. It was followed by a giant Palestinian flag,hand-woven and was held high by Palestinian women. Behind them was a sea of green,black and red Palestinian flags displayed by Arab and Palestinian youths. Meanwhile scores of Filipino American activists ms from different organizations led by Alliance for Just and Lasting Peace in the Philippines (AJLPP), KmB Pro People Youth, Gabriela Network-USA, Justice for Filipino American Veterans (JFAV) Pilipino Workers Center (PWC) and Ecumenical Fellowship (EFJP) joined the militant and passionate protest flying their multi-colored flags among the protestors. Later on Christine Araquel from AJLPP and Amanda Martin from GABnet spoke at end-rally in front of the Federal building after the march around Westwood area. The five-hour march-rally went on peacefully despite many provocations by Pro-Israeli demonstrators. 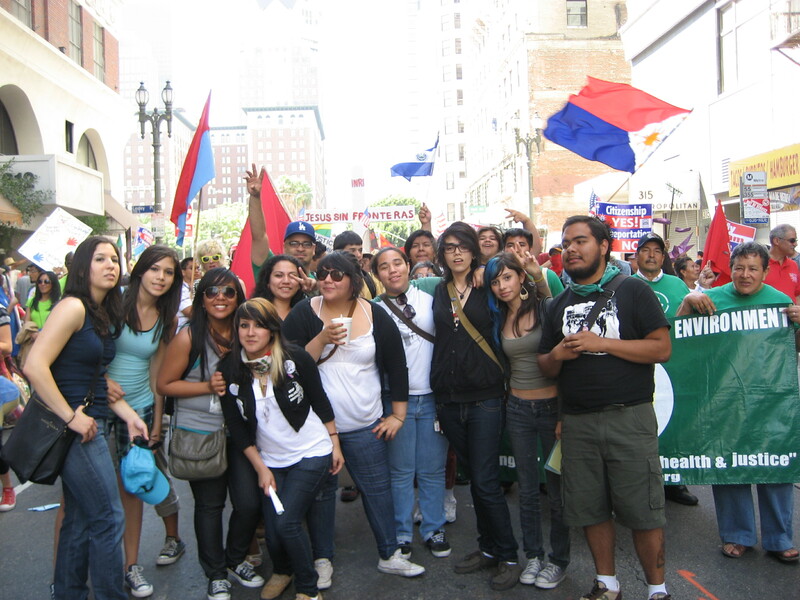 Active peace marshals from ANSWER-LA thwarted the moves of some of the provocateurs. There has been a series of protests by the ANSWER-LA and the Free Palestine Alliance since Israel began the bombing and the invasion of Gaza since the last two weeks. More than 10,000 people also protested in San Francisco on the same day. The ANSWER LA and the Free Palestine Alliance (FPA) called the Regional march protest on Saturday, January 10 at 12:00 noon in front of the Westwood Federal building, 11000 Wilshire/Veteran street. The Los Angeles protests coincides with the national day of protest and solidarity with Palestine -- all over the world and the United States especially in Washington DC where more than 30,000 people march in protest.